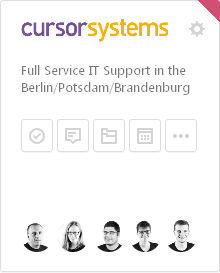 Thanks to our customer and sponsor cursorsystems – small IT company from Berlin. They sponsored Backups improvements in Freedcamp. For all our customers in Germany cursorsystems will be glad to talk to you if you are looking at implementing a help desk system for your business, collaboration software (including help with Freedcamp), planning systems and call center software.